I'm a huge fan of my Zoeva rose gold brush set so when the Zoeva 'Pink Elements' classic brush set* from one of my fave beauty sites Love Makeup turned up for me, I couldn't have been more excited. For a girly girl like me the colour Pink and makeup brushes are a very good combination as they look so pretty displayed on my dressing table! However, I also love that they have gunmetal grey ferrules and a matching gunmetal grey clutch bag as Pink and Grey is one of my favourite colour combos for a pretty yet sophisticated look. The clutch bag is fab for travelling too and I use it regularly. As with my beloved rose gold brush set, this set comes a mixture of eight different face and eye brushes, all of which are exceptionally soft to the touch and great quality. They're definitely the best makeup brushes I've ever used alongside Real Techniques and I'd recommend them to anyone! The set includes three face brushes and five eye brushes. Keep reading to find out a bit more about each of them and how I use them. 104 Buffer - This brush is a flat top kabuki style brush and very similar to the famous Sigma F80 brush. Its best used for buffing liquid foundation into the skin for a flawless finish. 109 Luxe Face Paint - This brush is unlike anything I've ever used before as its very thin and flat. However, I've found that its perfect for contouring as its small enough to place product precisely under the cheekbone and create definition. 127 Luxe Sheer Cheek - Another brush that's great for contouring due to its angled shape. However, I also think this is great for blush and highlight application too. 227 Luxe Soft Definer - This is a great fluffy brush for blending eyeshadow in the crease and is very similar to the famous MAC 217 brush. 230 Luxe Pencil - I tend to use this brush for detailed eyeshadow application underneath my eye or in the outer corner. I always wear shadow underneath my eyes on a night out to give them more depth and this brush is great for creating that look. 231 Luxe Petit Crease - Another brush that's great for applying shadow to the crease but this time its more detailed. If you prefer a strong line in the crease, this brush is great. It packs shadow on nicely and due to the pointed tip its great for a detailed look. 317 Wing Liner - This is the only brush in this set that I don't have a great deal of use for as I don't really wear liners that need to be applied with a brush. However, if you are a gel liner lover, I imagine this would work very well as its really fine and flexible. 322 Brow Line - I fill my brows in every day with powder so a brow brush is a must have for me. This one is quite short and stumpy so it packs colour on well and is great for creating a sharp line on the outsides of the brow. However, I prefer my Crown Brush angled liner brush for filling in sparse areas and creating natural hair strokes. Overall there's a fantastic selection of brushes within this set and the only one missing in my opinion would be a powder brush. However, if you aren't someone who likes to powder, this set would easily do a full face of makeup. Its a great one to get if you're just starting to get into makeup and want to invest in some brushes. Its available to buy here for £56.95. Not a bad price for eight high quality brushes and a bag! Do you like the look of the brush set? 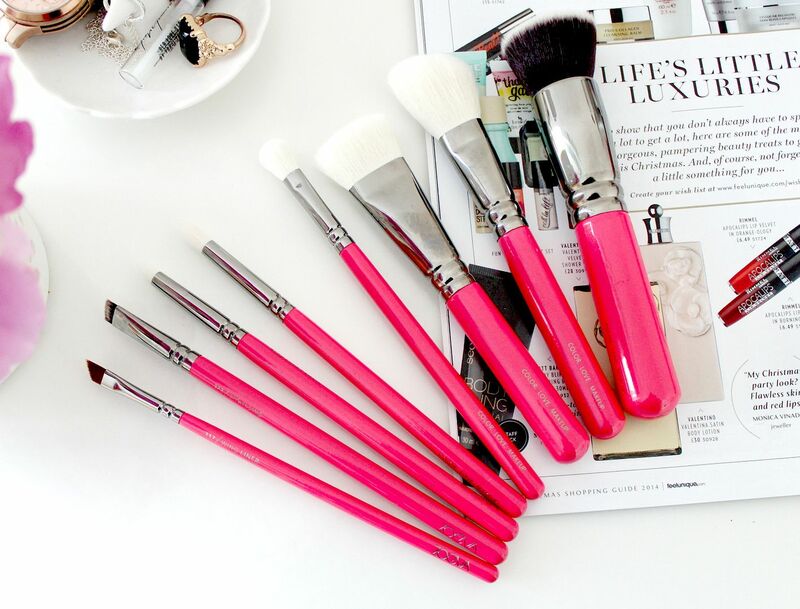 Really want to try out Zoeva brushes and I love how girlie these ones look! The face paint brush looks interesting, haven't tried a brush like that before! 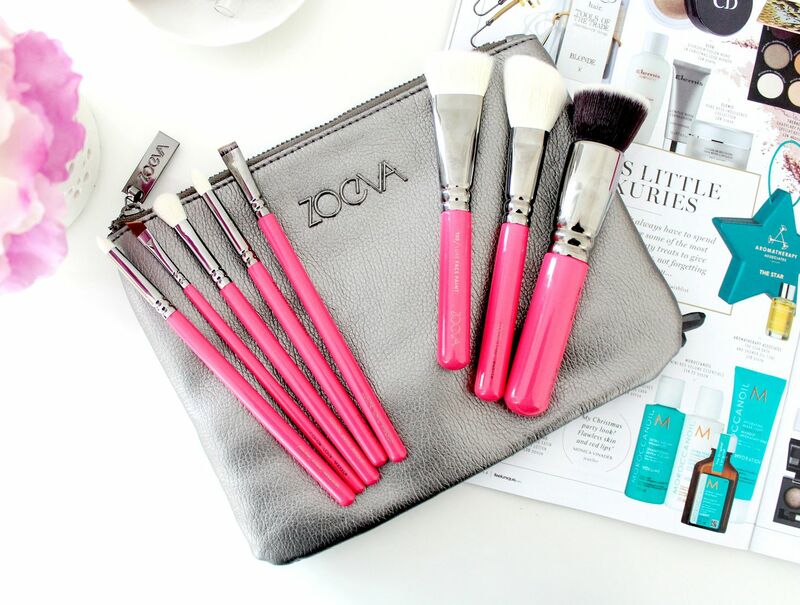 I've had my eye on Zoeva brushes for a while now, so this has given me major brush envy! That Luxe Face Paint Brush looks pretty similar to a NARS ita brush, which considering is around the £40 mark and this whole set is £16 more looks like a great buy! I love Zoeva, some of their brushes are pretty much the same quality as Sigmas! And great photos as always! I love Zoeva, they have great quality brushes! I've really been wanting to try Zoeva brushes and this set looks so great! I feel like each brush in this set would get used if I had it (which isn't always the case with brush sets). And the pink/gunmetal colour scheme is gorgeous! Love the look of this set, the colour is gorgeous! You're so right,pink+make up brushes goes so well together :) and thanks to your post i finally know which brush can be used for what,thanks for that. I am desperate to get my hands on some Zoeva brushes! They look amazing and I always hear suuuch rave reviews about them! aah they look gorgeous! i'm also a huge fan of the rose gold set! I really want to try some Zoeva brushes, these look amazing! There are so many brush collections I want to get my hands on! Need to gets some Zoeva in my life, especially the 227, 317 and 322! I love the blending brush! These do look lovely, but I'm not actually a fan of the bright pink. But their brushes are wonderful! That face paint brush looks very intimidating. I'd definitely be interested in trying it out. 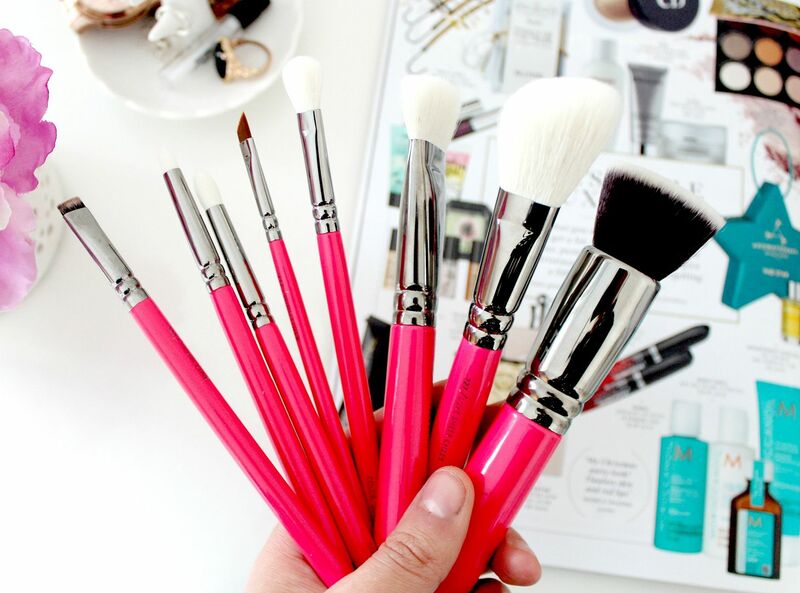 I've been looking for some new brushes so this post has me super excited! These look lovely,. This is such a cute set! I definitely need to buy some Zoeva brushes. But the pink does look really nice and I love it. This is such a great collection of brushes.the eye ones seem amazing! Oh so pretty!! And such a decent price for the whole set. You can tell there really good quality. Thanks for the heads up lovely. I love my Zoeva brushes! I have my eye on that contouring brush and can credit the Zoeva precise liner brush for helping me to master the wing, love it! The 227 looks great for blending! These are so cute and probably perfect for me as they are my fave color and they look so girly and pretty as you said. I'm going to try and find some but I did love the grey and pink together even if I'm also a fan of gold and pink. These are so pretty. I love how pink they are! I love the Zoeva brushes! They look so pretty pink I might have to splurge and buy them. i really want to get my hands on some zoeva brushes as there is only praise for them everywhere! Who can resist such pretty pink color? Love your review dear. You take such great photos! The packaging is gorgeous! 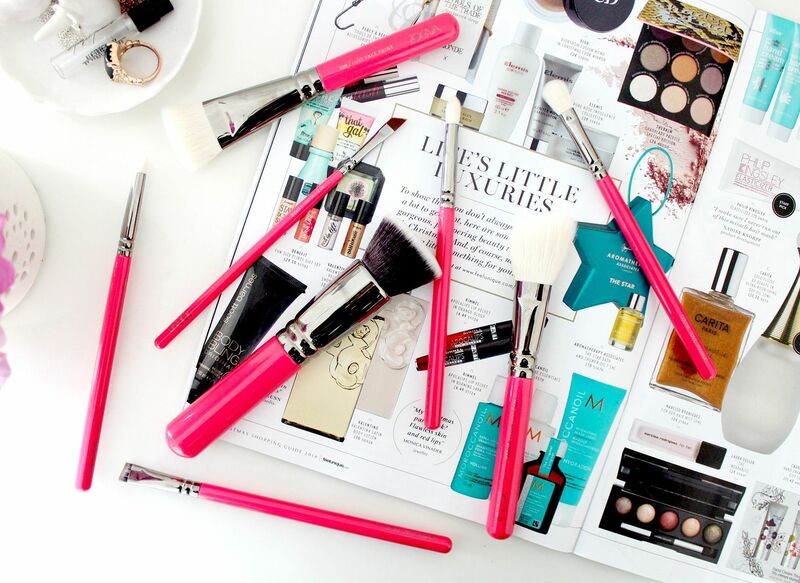 I have seen so many raves reviews of these brushes!